This part of the world is divided and diverse. First, some of the division and diversity. The unemployment rate in Montenegro is almost 22%. In other parts of the general area other religions are dominant - Islam, for example, in Croatia. The history of human occupation of this area can be traced back to 5 B.C. Actually, we visited one place, Risan, to see some Roman mosaics that were discovered in 1930. Their restoration has been on-going since then and the archeologists evaluate that they date from the end of the 2nd century BC. Risan is mentioned as far back at the 3rd century BC. We also visited the World Heritage Site of Kotor, a walled city of magnificent proportions that was started in the 9th century. Once one enters one of the city gates, prepare to be lost because the place is a maze of streets. It is crowded with shops, places to eat and churches - lots and lots of churches - some within just a matter of yards from each other. Kotor is the location, we were told, of the oldest Roman Catholic Church, originally built in the early 12th century. This church is called St. Tryphon’s Cathedral. Travel like this, like life itself, is hard. It is also, like life itself, a lot of positive things. But, it is hard. Evidently the tour company wants people to feel like they are “getting their money’s worth.” We are. It is, nonetheless, early morning schedules, lots and lots of walking, changing hotels sometimes every day, etc. We spent almost an entire day being guided through and hearing an outstanding lecture about the ancient city of Dubrovnik. Many of the other international trips we have taken have had specific religious orientations - the Santiago de Compostela pilgrimage or the St. Nicholas pilgrimage, for example. This one has not. It has, however, turned out to contain a ton of “religious” information as well as multiple opportunities to reflect on core spiritual values and teachings. For example, in the city of Split, Croatia, we saw some of the work of the sculptor Ivan Mestrovic. Though I had never heard of him until this trip, he was a very prolific artist. Two of his many pieces are huge sculptures commissioned by the city of Chicago. 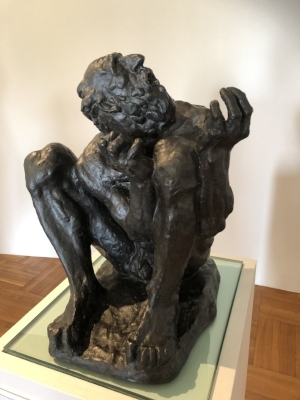 He became very wealthy, unheard of for most artists during their lifetime, and ended his career spending many years on the faculty of Norte Dame where the campus has numerous of his works on display. He built and donated the museum in Split to display some of his works. If you look him up on Wikipedia, you can see some of his works. He was primarily interested in religious themes and I found his works moving. 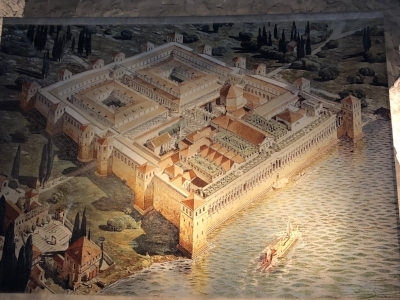 Then, also in that city, is Diocletian’s palace. Diocletian, you may remember, was the emperor who preceded Constantine. He is the one who began lifting a ban on Christianity. Diocletian himself worshipped the Roman god, Jupiter. He had a temple built to him here as well. I read, as I referred to in my last post, a book in preparation for this journey. That book, written before the involvement of NATO in the Serbian/Bosnian conflict in the early 90s described the conflicts and tensions that existed in this part of the world. Though these conflicts involved ethnicity, they were primarily about territory. On the day I am writing this post we are near the end of a day in Sarajevo. Most people have heard of this city as the Winter Olympics have been held here twice. This is also the site of one of the largest and most horrible genocides in recorded history. For reasons that are not clear to me, news about what was really going on here did not really get much attention in the United Staters. It did in other countries because so many people from here fled elsewhere. I do not remember getting news of how the Serbians had completely blockaded Sarajevo. Their intent was to destroy the city completely and to wipe out the entire population. Had it not been for eventual international intervention, they may have succeeded. Much of the city has been rebuilt. Some of the buildings, even in the heart of the city, are still rubble. The buildings that were not destroyed clearly show the signs of gun shots and shrapnel on their exterior. Our guide for this day, a young Bosnian man who is also a professor in the university here, took us to see what is referred to as The Tunnel of Life or The Tunnel of Hope. This tunnel was built, or dug, in a few months early in 1993. (Look up Sarajevo Tunnel for more and for images.) This tunnel allowed food, war supplies, and humanitarian aid to come into the city, and allowed people to get out. It is an amazing feat of engineering in a time when technology was not nearly what it is now. See what I mean about spiritual lessons and values everywhere? We need a “tunnel of hope” and/or a “tunnel of life” in our time and world. In the midst of our own personal and global divisions and divisiveness we could use wise and skillful ways to connect to those “supplies” that might lead to an end to all this crazy conflict. One of the things I noted about our guide was what a great sense of humor he had, always joking and seeing the funny side of things. He said that this was one of the marks of Bosnian people - a good sense of humor, a happiness not dependent on circumstances. He also said that the Bosnians were marked by stubbornness. The spiritual word for this is “determination.” Not to give up hope as a value regardless of how the future might look. On that first day of arrival and after we had decided on hiring a driver to take us on the very long five plus hour drive to the place where this journey was to begin, we were greeted with another site that neither a camera or words can adequately convey. As we were driving and daylight was turning into dusk and then darkness, we saw coming up over the horizon the biggest, brightest and most beautiful moon I think I have ever experienced in my lifetime. Truly, I have never seen anything like it. It captivated the four of us in the car. Each of us was moved by it. We talked about it. It brought us together. All the people regardless of their ethnic, religious or national identities on the globe who are now, have been or will be on the planet share this: we are all born under, live under and will die under the same moon. If only we could look up and see that which marks us all as living members of the same human species, we might not be so mindless and end up doing or saying things that contribute to hurting rather than healing our humanity and our planet.